For making charms and magic effigies. He knew their seat, humor and condition. He was a perfect practicing physician. He gave the man his medicine then and there. They had been friendly for a goodish while. Scotch Bernard, John of Gaddesden, Gilbertine. Only digestive nutritives and such. He did not read the Bible very much. Gold stimulates the heart, or so we’re told. Before describing the training of a physician such as this, a. few words are pertinent about the establishment of the early universities. The earliest institutions had existed for an indefinite period before .they obtained a legal charter, and have no date of founding. Universities with such obscure beginnings existed in the 12th century in Bologna (2), Paris (3), Montpellier (4, 5) and Oxford (6). About ten more universities were founded and began to flourish in Europe during the 13th century, and after 1350 the establishment of universities increased rapidly. They were administered in one of three ways. Examples of these are the University of Paris, where the rector was elected by the guild of masters of the faculty of arts (3); Bologna, where the rector was elected by the guild of students (2, 7); and Naples, which was governed by representatives of the Holy Roman Emperor (8). For a long time following the decline of Rome – perhaps from the 5th to the 11th centuries – medicine was practiced by monks. Very little is known about their medical learning. It appears safe to assume that it was gained incidentally to training in theology and grammar. The Dominicans and Franciscans particularly achieved reputations for medical practice, probably because they traveled about rather than remaining in their monasteries, thus being able to offer solace to more people. Treatment consisted largely of exorcisms and prayers, although blood letting gradually became added to the armamentarium (9). During the same period that universities were beginning to develop, the Church hierarchy became concerned with the secular activities of the monks, which were said to have increased to the point of interfering with their religious duties. The first official notice of this concern is contained in a resolution of the Council of Clermont of 1130, which enjoined monks and regular canons from the study of jurisprudence and medicine “for the purpose of temporal gain.” The same edict was repeated at the more important councils of Rheims and the second Lateran in 1131 and 1139. The emphasis was against practice on a professional basis rather than on eradicating all involvement in medicine. Not long thereafter, at the Council of Tours in 1163, monks were forbidden to leave their cloisters for more than two months at a time and were prohibited from practicing as well as teaching medicine. This canon was reinforced in 1179, but still was found inadequate to alter long standing customs. Thus, Pope Innocent III issued an edict through the fourth Lateran Council in 1215 which was addressed not to the lowly monks, but to deacons and priests prohibiting them from participating in operations in which blood was shed. Further decrees by Popes Boniface VIII and Clement V at the turn of the 14th century formally separated the practices of surgery and physic (3, 9, 11). By the middle of the 14th century, after nearly two centuries of increasingly stringent ecclesiastic pressure to separate the religious vocations from medical practice, some of these restrictions were being set aside by papal dispensations. Due to this, for instance, clerics obtained permission to study, lecture and to practice where the regulations of the University of Paris held sway. Nevertheless, the secula­rization of medicine had become and largely remained an accomplished fact. The transition from the medicine of monastically trained and untrained healers to a preponderance of secular physicians was slow, and the effect of the universities on this process developed even more gradually. The school of Salerno, near Naples, is generally acknowledged as the first European school of medicine. While there are references to specific physicians who practiced there in the middle of the ninth century, we know nothing of the development of an organized school. The fame of Salerno is related to its training of physicians and the fact, which undoubtedly aided the training, that due to its location it became a crossroad where Greek, Arabic, Hebrew and Roman medicine came into contact. It achieved the apex of its prestige in about 1100. In the 13th century a university was chartered at Salerno, but it, was overshadowed by the new university in Naples, and never attained importance. Emperor Frederick II seems to have recognized the problems of having faculties of insufficient size, because seven years after he had founded the University of Naples he specified that it should not have a medical faculty in competition with Salerno (8). Despite its recognized educational significance, the school of Salerno remained isolated from the evolution of the universities. By the end of the 13th century it was being superseded by the medical faculties of Paris, Montpellier and Bologna, and soon by several more (12). The development of medicine at Montpellier was influenced by the Salernitan teaching. Medicine was being taught in this little town in the south of France in the 12th century, although the first extant regulation which refers to a medical “university” (i.e., faculty) and a presiding master dates from 1220. Faculties of law and the arts, or universities as they were then called, developed in the 13th century, and the University was chartered by Pope Nicholas IV in 1289 (4, 5). This sequence of growth was unique because, typically, faculties of medicine were later additions to universities and in prestige as well as size trailed far behind some others – most often the faculties of canon law and civil law. Medical education had a particularly slow and undistinguished beginning in England. At Oxford the earliest mention of a medical faculty dates from 1303, when a single regent-master was in residence. When New College was founded in 1379 its statutes provided that of a total of 70 fellows only two might study medicine; at Magdalen College, founded in 1458, only one of its 40 fellows was permitted to become a medical student. Not only were few students permitted to study medicine, but the regulations made it impossible to develop a faculty locally. This was because students of medicine subsequently were required to take priestly orders, and priests were forbidden to lecture on medicine! (13). In the 14th century foreign professors were not excluded from most university faculties, but one can imagine that a professor from one of the prestigious Italian universities or from Paris would not consider a rural school such as Oxford particularly attractive (6). Cambridge University was modeled after Oxford. The earliest known medical statute there dates from 1396, but a medical degree had been conferred as early as 1350. In the entire 14th century only 42 physicians are known to have graduated from Oxford and seven from Cambridge; in the 15th century this increased only minimally: 67 from Oxford and 40 from Cambridge in the entire century! In the 23 years from 1488 to 1511 0.7 per cent – 28 of 3827 graduates from Cambridge – took a degree in medicine (14). In 1231 Frederick II promulgated a set of laws concerning medical education standards and licensure that were far ahead of his time. Although these laws did not have an immediate effect on medical training and practice, his codification of the importance of premedical education probably reinforced and stabilized an educational method which was developing and which became a cornerstone of the professionalization of physicians. Conversely, the premedical educational requirement became a major reason why surgery, for which this usually was not required, became relegated to a position subsidiary to medicine. A part of Title 46 of Frederick’s code, as translated by E. F. Hartung (8). No doctor shall practice after the completion of the five year period who has not practiced for an entire year under the direction of an experienced doctor. During the period of five years the masters shall teach in the schools the authenticated books of both Hippocrates and Galen, and shall instruct in the theory as well as in the practice of medicine. Moreover, we decree as a measure for the public health that no surgeon shall be admitted to practice who does not present testimonials from masters in the faculty of medicine, stating that he has studied for at least a year in that field of medicine which develops skill in surgery, in particular, that he has learned in the schools the anatomy of human bodies, and that he is proficient in that field of medicine without which incisions cannot be safely made nor fractures healed. How long did it really take to become a university-trained physician? 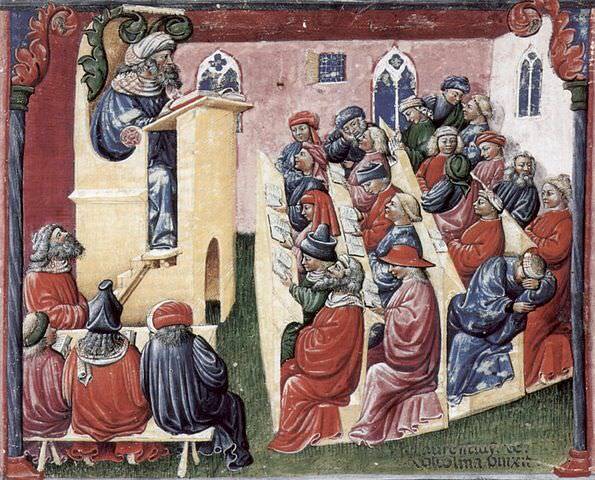 At Montpellier in the early 14th century a liberal arts degree was not required for admission to medical study, but there, as in other universities, having a degree permitted a shorter curriculum. Six years were required to become a master of medicine – the equivalent of a doctorate – or five years when the student already held a Master of Arts degree. Six months of practical experience followed the five or six years of lectures. The student could stand for examination for the degree of bachelor of medicine after three years. If he passed this and chose not to continue his training he could practice in the countryside but not in Montpellier, and would not be eligible to join the faculty (4). In Paris in 1270 the medical curriculum required six years without a liberal arts degree and five and a half years with one. By 1350 having a Master of Arts degree saved 12 months from the period of medical training. At the end of the 14th century virtually all Paris medical graduates also were masters of Arts (3). At Bologna academic study was a little shorter: five years without a liberal arts degree and four years with this qualification (2). Technically, the medical faculty of the University of Paris was constituted of all the legally qualified physicians of the city. However, already before the end of the 13th century two categories of faculty had developed: the masters-regent, who were the principal faculty, and the non-regent masters. The latter were primarily practitioners who lectured when called upon. During the 14th century the medical faculty usually numbered between 30 and 40. This figure probably included both the regent and the non-regent masters and, if so, represented the number of licensed physicians in the city (3). There is little information about academic incomes at the medieval universities. The major source of income of professors was the fee paid to them by the students for each course they attended. At Montpellier the regent-master received the entire fee set for the course, but when it was taught by a non-regent the fee was divided between the teacher and the university (5). At the Italian municipal universities, in addition to the students’ fees, a stipend was also paid by the city (7). The first recorded salaries of medical teachers at Bologna are from the middle of the 14th century. These incomes were less than those of professors of law, but generally higher than those of the liberal arts faculty. Although the fee for medical lectures was less than for lectures on grammar this was because the medical students were considered to require less individual attention. Consequently, the medical lecturer probably addressed and collected fees from a larger class (15). The proportion of the income that was derived from teaching and from practice is unknown. Many professors also had an incidental income from lodging students in their homes. Even though the practice of medicine could lead to a considerable affluence, as Chaucer indicated in the passage with which I began this paper, in most universities in the 14th century the prestige of medicine remained beneath that of other faculties. One sign of this in Paris was that the medical faculty did not obtain its own building until 1505, having taught until then in various churches, including Notre Dame. The curriculum of the several schools of medicine was similar and evolved very slowly. The main trend of this evolution was the addition of more Arabic texts to the nucleus which consisted mainly of the writings of Hippocrates and Galen. Therapeutics initially was based on the Materia Medica of Dioscorides, a contemporary of Galen in the 2nd century A.D., and later on the Antidotarium of Nicolaus of Salerno (12th century). Of the Arabic authors those who are considered most prominent in modern times were Rhases, who wrote in the 10th century and Avicenna, who wrote in the 11th. All instruction was carried out in Latin, and the texts were Latin translations of Arabic translations from the original Greek, or of Arabic originals. Many of the translations were the work of Constantine of Carthage in the 11th century. The lectures consisted of detailed, phrase by phrase interpretations of the authorities and of commentaries upon them by other authorities. For instance, at Paris the students began with 20 lectures on the Isagoge of Johannitius (Ibn Honein, 809-873), a survey which dealt with elements, seasons, foods, fevers, etc. Fifty lectures were devoted to the Aphorisms of Hippocrates, 26 to his Prognostics, and 38 to the Regimen in Acute Diseases. One lecture per week for about a year was spent on treatises on urine and another on the pulse (13). Even though by the 14th century a rather large number of texts were at least potentially available, much time was allotted to recapitulation. In some schools no new material was presented during the last year. The lectures were supplemented with the rote learning of answers to set questions on the order of a catechism. The scholastic approach to knowledge permitted no questioning of the written authorities. The final examinations were exhaustive, lasting at least several days and in some institutions for more than a week. No information is available about the rates of failure. However, at Paris the candidates had to swear that they would not harm their examiners in the event that they were failed (3). What library resources were there during this time when all books were copied by hand? Most is known about the situation in Paris, which probably also was the most favorable. The nucleus of a library for the fledgling university was a gift of some 300 volumes by Richard de Fournival (1201-1260). He made a detailed catalogue, entitled Biblionomia, the medical section of which contained 125 titles by 36 authors in 30 volumes. Whether he actually owned all of these, or whether this was a model plan for a library is uncertain (15). A catalogue of 1338 listed 60 medical titles and specified that five were missing. During the 14th century the university library grew primarily from bequests and donations by faculty (16). In view of the value of books, this is another evidence of the relative affluence of the professors. A second important resource, the Royal Library, was developed in Paris in the 14th century, particularly due to the patronage of King Charles V (the Wise), who ruled from 1364 to 1380. During his lifetime its medical holdings included 48 manuscripts. According to the catalogue of 1424 this number had grown to 61, including 12 on surgery. This library was also available to the faculty and students of medicine (17). The first acquisition of a substantial number of medical texts at Oxford University did not occur until about 1400. These were included in the library which William of Wykeham (d. 1404) presented to New College, which he had founded in 1379 (18). We must now turn to the practice of dissection and the training of surgeons. In the regulation which I quoted, Emperor Frederick II specified the importance of learning human anatomy. He implemented this in 1238, albeit rather weakly, with a directive that a corpse was to be dissected at Salerno every five years in the presence of the physicians and surgeons (8). Dissection was begun at Bologna in about 1270, and the first mention of a post-mortem examination occurred in 1302. This was a judicially ordered inquiry into a possible murder. However, dissection for the purpose of teaching anatomy soon followed. Public dissection may have been begun by Mondino of Luzzi (1276-1328) as early as 1306, and based on these dissections, he published his Anathomia for his students in 1316 (2, 19). A statute of Montpellier of 1340 provided for a human dissection to be performed every two years. In 1376 dissection received royal sanction at Montpellier. Condemned criminals were to be furnished to the school after, they had been executed. The fact that this order had to be repeated several times suggests that the king favored the practice and also that at a lower, presumably ecclesiastic level, it was being resisted (4, 5). No dissection was performed at Paris during the 14th century, the first one having been recorded in 1407: This, like the first dissection at Bologna, was ordered in the hope of determining the cause of death (of a bishop), rather than for the teaching of anatomy (3). The practice of the monastic healers had made no distinction between medicine and surgery. The separation of surgeons from physicians came about in the 13th century. Whether surgeons were trained in a university or learned entirely as apprentices, they did obtain some practical knowledge. In this they differed from the physicians, whose education, with some possible exceptions such as at Montpellier, was almost entirely in theory, following upon a foundation in rhetoric, astrology and philosophy. Generally physicians also had to take clerical vows of at least a minor degree. Perhaps because of strict adherence to the Papal edicts which prohibited clerics from performing surgery, this discipline was not taught at Paris during the 13th and 14th centuries. The ostracism of surgery from the University of Paris influenced universities which were modeled after it, such as Oxford and Cambridge. In universities in which surgical training was provided, such as Montpellier, Bologna, and Padua, this was conducted separately from the education of physicians (3, 10). There is no information about the length of the surgical apprenticeships, but they undoubtedly were at least as long as those of the barber-surgeons, which in France required four years. If a surgeon wished to become a physician, besides the usual qualifications, he had to swear that he no longer would practice surgery (20, 21). The first surgical organization, called the College of Saints Cosmas and Damian, was founded in Paris in 1258. Examination of surgeons became mandatory in Paris in 1311, but in Montpellier not until 1399. In Paris the examiners were masters of the College, and in Montpellier they were masters of the university faculty. The surgeons obtained permission in the 14th century to wear a long robe in imitation of the physicians. They increasingly restricted their practices to major procedures, such as extracting bladder stones, couching cataracts, and performing amputations (20). The College of Saints Cosmas and Damian was incorporated as a faculty of the University of Paris in 1416, but surgeons were not permitted to attend lectures of the medical faculty until twenty years later. Even then they could not obtain a medical degree without relinquishing their surgical practices. That the proximity of surgeons still caused the physicians anxiety was shown in 1466 when the faculty demanded that the surgeons take an oath that they would not prescribe medicines. The surgeons refused to promise not to act as physicians, and this jurisdictional dispute lasted sixty years. On the other hand, there is no indication that physicians had to be discouraged from practicing surgery. By now you may have concluded that the universities did not train enough medical practitioners during the Middle Ages to take care of the needs of the population. However, both the size of the population and the proportion whom the university graduates were intended to serve must also be taken into consideration. Population estimates for the Middle Ages are based on sparse date and many assumptions. According to the estimates of Russell (22), the population of Paris at the end of the 13th century was about 60,000, and may have reached 90,000 in the 1340s, before the first plague pandemic. It did not grow beyond 100,000 until the first half of the 16th century. One can not relate these figures to a medical community of 30-40 physicians and conclude that there was one physician per 3,000 Parisian citizens. The university-trained physicians remained in the cities, usually in the city in which they had graduated and, therefore, had been licensed. The impoverished peasantry could not afford to be treated by licensed physicians and hence the doctor to population ratio only was a factor in the retention of physicians in the cities. The middle class was too small to utilize many physicians. Therefore, this elite segment of the healing profession virtually treated only the narrow, uppermost stratum of the society, the ecclesiastic and secular nobility, and the number of physicians coming from the universities may have been adequate for this. The unmet needs of the population resulted not in the training of more licensed physicians, but in increasing efforts to prosecute unlicensed practitioners. The prosecution was delegated to the professors. Time employed in this activity not only infringed on their availability for practice and teaching, but also raises the suspicion that the medical faculties strove to restrict the number of physicians to maintain their elite position. However, official documents of the period suggest that the rulers were sincere in their desire to maintain standards of medical practice and employed the professors as the most appropriate, if also willing agents of this policy (23). The quality and cost of the care furnished by physicians was widely criticized. The diatribes against physicians by Petrarch in the mid-14th century are the best known expressions of this dissatisfaction (24, 25). However, just as today, the criticisms did not lessen the desire for medical care. A cycle resulted which repeated itself with great similarity in various countries: 1) The void of care was filled by unlicensed practitioners who were considered poorly trained or were untrained; 2) The licensing body, or even the king or Pope, attempted to suppress them and failed; 3) The practitioners organized themselves both to be better protected against official attack and, eventually, to establish some exclusiveness for themselves; and 4) Official recognition was given. You may ask what difference it made whether or not the practitioner was trained, since the training was so remote from modern physiologic principles. However, in the Middle Ages, just as in our day, truth is that which is contemporarily believed, and truth is accepted as beneficial. Consequently, the healer who had been taught the accepted truth was expected to be more effective. Learning truth by performing grammatical analyses of Latin texts which had been translated from the Greek via Arabic is not really inferior to the truths of the 20th century Biblical interpretations which were predicated on the premise that the Apostles wrote Jacobean English! The other categories of the healing profession remain to be cited, those which were far removed from the universities, but to which the bulk of the populace turned. Barbers existed in the 12th century or even earlier, but their importance in medicine increased in the 14th century because the surgeons, who were striving for their own elite niche, refused to perform treatments which they alleged would degrade them. In France an ordinance of 1372 authorized barbers to treat “boils, tumors, and open wounds, if the wounds are not fatal,” This, undoubtedly merely recognized an existing practice. The barbers even took over the major therapeutic modality of blood letting. In dress the barber-surgeons were distinguished from the surgeons in that the former wore a short rather than a long robe. According to a statute of 1383, “the King’s first barber and valet controls the trade of the barbers of the city of Paris…” and he also headed the barbers and barber-surgeons of the kingdom. In 1396 there were in Paris 31 licensed physicians, 10 members of the surgeons’ guild, and more than 40 barber-surgeons. The Faculty of Medicine established a course for barbers in 1505, but since this was given in Latin, which most of them did not know, it drew them no closer to the university (20). In London surgeons and barbers encountered less hostility than in Paris because London had no university and there was no local medical faculty with which to contend. The Barbers’ Guild of London was already referred to in 1308, when it was primarily a religious organization. In 1368 for the first time three surgeons were appointed as Master Surgeons of London and an organization of surgeons was founded which was to supervise practice. On Monday, 10th April in the thirteenth year of King Richard the Second, Master John Hynstock, Master Geoffrey Grace, Master John Bradmore and Master Henry Sutton, surgeons were admitted in the Court of Guildhall in London before William Venour, Mayor, and the Aldermen. They were sworn as Masters Surgical of the aforesaid city well and truly to serve the people in working their cures, taking of them reasonable recompense, &c. To practise truly their trade and make faithful oversight of all others both men and women, occupied in cures or using the art of surgery, presenting their lack both in practice and medicine so often as needs be to the aforesaid Mayor and Aldermen. They shall be ready when warned thereto to take charge of the hurt or wounded and to give faithful information to the servants of the City of such hurt or wounded as are in danger of death or not (26). In 1409 the barbers sued because they felt that the surgeons were infringing upon their prerogatives of practice, and they were upheld. The Barber-surgeons’ Guild was officially chartered as a quasi-medical organization in 1462, and in 1493 the independent surgeons – those who did not belong to the Surgeons’ Guild – were taken into the guild of the barbers. King Henry VIII chartered the Royal College of Physicians in 1518, and in 1540 granted a charter to the Barber-Surgeons Company of London This, at last, in 1800 evolved into Royal College of Surgeons (20). A healing art about which the physicians and surgeons did not dispute was midwifery. Guy de Chauliac, the most famous surgeon of the 14th century, stated in his treatise on surgery that he was unwilling to dwell at length upon midwifery, seeing that as a rule it is practiced by women (21). Midwifery was learned as a trade, but there were no formal apprenticeships. Regulations everywhere prohibited women from becoming physicians. The prohibitions hinged mainly on the requirement that physicians must belong to at least a minor level of clergy, which was forbidden to women. Surgeons did not have such a requirement and therefore, technically women could become surgeons. We have no information about how common this was. The typical way in which this came about was for an ambitious midwife, with or without formal training, to expand her practice to encompass procedures which were considered the prerogative of surgeons. These informally expanded practices sometimes led to lengthy litigations about unlicensed practice, and some of the practitioners were even excommunicated (23). Women surgeons existed mainly in Italy and France (21). The other important members of the healing arts were the apothecaries and the herbalists. The latter were held to be inferior, as barbers were inferior to surgeons. Physicians were particularly concerned about the training and practices of the apothecaries because they were dependent on their services for the supply of medications. Inspection of apothecary shops was included among the ordinances of Frederick II early in the 13th century; it became required in Paris in 1353 (8, 20). Because most medicines were botanicals it seems a natural evolution that in England the early apothecaries largely were members of the guild of spicerers-spice merchants. This was still true well after 1312 when an organization of apothecaries already existed in London. As early as 1313 there was a court apothecary, one Odin the Spicer (26). In some ways the apothecaries had to be more learned than the surgeons or barbers, because they had to be able to read Latin, both to fill prescriptions and also, when available, to employ references. In France an apothecary’s apprenticeship lasted four years; its duration in England is uncertain. These practioners, like the physicians whom they served, largely remained in the cities, while the relatively untrained herbalists practiced in the countryside. I have tried to show that two trends developed in the healing arts during the Middle Ages. One was the introduction of medicine as a university discipline, with attendant professionalization and prestige. The other, in part as a consequence of the restrictions imposed by this professionalization, was the fragmentation of medical practice into a complex hierarchy of levels of responsibility and esteem. 1. Chaucer, G.: The Canterbury Tales. Trans. by Coghill, N., Baltimore: Penguin Books, 1951. pp. 36-37. 2. Bullough, V.L. : “Medieval Bologna and the development of medical education”. Bull. Hist. Med. 32:201-215, 1958. 3. Bullough, V.L. : “The medieval medical university at Paris.” Bull. Hist. Med. 31:197-211, 1957. 4. Cooper, S.: “The medical school of Montpellier in the 14th century.” Ann. Med. Hist. 2:164-195, 1930. 5. Bullough, V.L. : “The development of the medical university at Mont­pellier to the end of the fourteenth century.” Bull. Hist. Med. 30:508-523, 1956. 6. Bullogh, V.L. : “Medical study at Medieval Oxford.” Speculum 36:600-612, 1961. 7. Puschmann, T.: A History of Medical Education. Trans. by Hare, E.H., New York: Hafner, 1966. pp. 221-223. 8. Hartung, E.F.: “Medical regulations of Frederick the Second of Hohenstauffen.” Med. Life 41:587-601, 1934. 9. Hammond, E.A. : Physicians in Medieval English religious houses. Bull. Hist. Med. 32:105-120, 1958. 10. Talbot, C.: “Medical education in the Middle Ages.” pp. 73-87 in O’Malley, C.D., ed. : The History of Medical Education. Los Angeles: Univ. of California Press, 1970. 11. Jones, I.B. : “Popular medical knowledge in fourteenth century English literature.” Bull. Hist. Med. 5:405-451, 1937. 12. Kristeller, O.: “The School of Salerno: Its development and its con­tribution to the history of learning.” Bull. Hist Med. 17:138-194, 1945. 13. Talbot, C.H. : Medicine in Medieval England. London: Oldbourne, 1967. pp. 64-71. 14. Robb-Smith, A.H.: “Medical education in Cambridge before 1600.” Pp. 1-25 in Rook, A., ed. : Cambridge and its contribution to medicine. London: Wellcome Institute, 1971. 15. Rashdall, H.: The Universities of Europe in the, Middle Ages. New ed. by Powicke, F.M. and Emden, A.B., Oxford Univ. Press, 1936. Vol. I, p. 240. 16. Seidler, E.: “Die Medizin in der “Biblionomia” des Richard de Four­nival.” Sudhoff’s Arch. Gesch. Med. 51:44-54, 1967. 17. Seidler, E.: “Der litererarische Hintergrund der Pariser Medizin im 14. Jahrhundert.” Gesnerus 22:30-58, 1965. 18. Cholmeley, H.P. : John of Gaddesden and the Rosa Medicine. Ox­ford, Clarendon Press, 1912. p. 114. 19. Puschmann, op. cit. 7, pp. 242-249. 20. Bullough, V.L. : “Training of the non-university-educated medical practitioners in the later Middle Ages.” J. Hist. Med. 14:446-458, 1959. 21. Puschmann, op. cit. 7, pp. 266-276. 22. Russell, J.C.: “Late Ancient and Medieval Population.” Trans, Amer. Philosoph. Soc., n.s. 48:part 3, 1958. Pp. 107, 119. 23. Fibre, P.: “The faculty of medicine at Paris, charlatanism, and unlicensed medical practices in the later Middle Ages.” Bull. Hist. Med. 27:1-20, 1953. 24. Cholmeley, op cit. 18, pp. 101-105. 25. Benedek, T.G. and Rodnan, G.P. : “Petrarch on medicine and the gout.” Bull. Hist. Med. 37: 397-416, 1963. 26. Power, D.: “English medicine and surgery in the fourteenth century.” Lancet 2: 176-183, 1914. We thank Professor Benedek for his permission to republish this article. Some minor changes were made to the text to correct typographical mistakes found in the original publication.